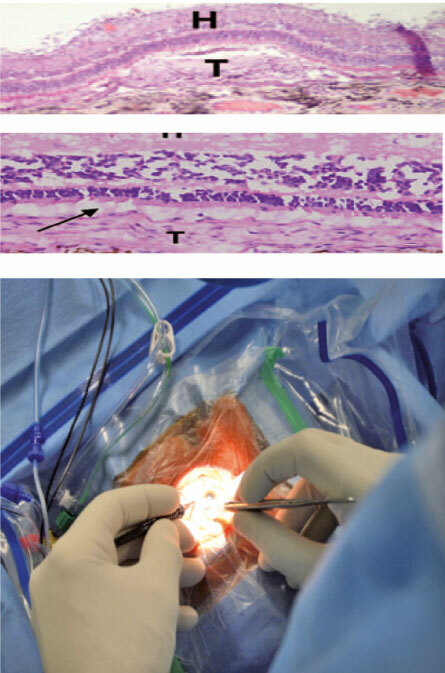 Restoration of visual function through retinal regeneration by means of human foetal transplant implantation in the subretinal space in patients with legal blindness due to geographic atrophy secondary to age-related macular degeneration and secondary to retinitis pigmentosa. Objectives: Retinal regeneration by implanting sheets of neural retina with retinal pigment epithelium obtained from 10-12-week-old aborted foetuses, and implanted under the host retina of patients through a pars plana vitrectomy and retinotomy with a specifically designed spatula. Approved for clinical application by the Ethics Committee and Health Authorites. Ongoing pre-clinical of the implantation technique in animal models.